One of the greatest challenges of serving our island nation partners in the South Pacific is the high cost and challenges that our volunteers had to go through to book their flights. After sharing those challenges with the key staff of Air New Zealand, we are excited to announce a program that they have developed that not only provides our Sea Mercy volunteers with greater flexibility and service (a dedicated staff member for Sea Mercy volunteers to call), but also at a lower price point. We are grateful to Air New Zealand for taking the time to listen to our many needs and requirements and providing us with a way to simplify our volunteers travel process. When booking your upcoming travel arrangements for your 2014 rotation, be sure to connect with them first. All Sea Mercy volunteers who have registered for a 2014 rotation will be sent the Air New Zealand contact information. MedShare has filled a vital role and need for Sea Mercy. The need for medical supplies to support the Floating Health Care Clinics. MedShare enables Sea Mercy to acquire the much needed supplies at a fraction of the cost. For more than 20 years, NEWS-Line Publishing has been a trusted source of news, career opportunities, and information for allied health professionals. We cover 10 professions and 12 specialties, and come in a variety of print and online formats for our readers nationwide. Visit News-Line.com to sign up for your free subscription today! Scenic Hotels has become one of our most dedicated and caring sponsors in the South Pacific. From disaster relief to delivering eye care to the school children, Scenic has always been the first sponsor to step forward to help us meet the need of the hour and make our programs exceed our goals and to help our volunteers to feel special. Our eternal gratitude goes out to our friends at Scenic Hotels. Sea Mercy was very encouraged to receive a sizable donation and letter of recognition from the Matson Foundation. We are so grateful for their donation and it have put it to good use in streamlining our volunteer submission and communication processing. This will help Sea Mercy coordinate and deliver the health care volunteers needed to meet the needs on the hundreds of remote islands that we serve. "OvationHR is an enthusiastic supporter of Sea Mercy in its mission to deliver much needed medical care to people in the South Pacific. I have worked with Rich and Stephanie Hackett for several years and know that this mission is close to their hearts. Rich has been able to forge relationships across the globe that will assist Sea Mercy in delivering medical services to people who would otherwise be unable to receive it. It will be exciting to follow their efforts and witness lives being changed for years to come." Not only does Pearmund Cellars offer some of the best wines to be tasted in Virginia, close to DC, but its foundation in innovation and expert winemaking is at the core of the entire Virginia Wine Industry. Executive winemaker Chris Pearmund is an innovator in the industry, and has served as a consultant to many wineries in Virginia. More importantly, he and his wife Susan are great supporters of Sea Mercy. They have an incredible 2011 'Old Vine' Chardonnay that they have created a private label for Sea Mercy and will donate $5 for every bottle purchased. They also created a "Sail the Chesapeake" raffle that you don't want to miss! Cruisers Forum The heart of a sailor is evident in the promotion efforts and the ongoing support of Sea Mercy through the Cruisers Forum. Please take a moment to pay them a visit and join this incredible world cruising community. Multihulls Magazine We are thankful for the support and attention given by Eric Erwin with Multihulls Magazine and their showcasing of Sea Mercy in their November/December 2012 magazine (download the PDF at the bottom of the page). 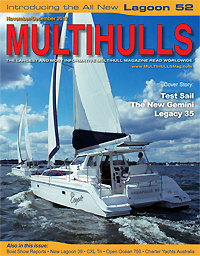 Multihulls Magazine is the largest and most informative multihulls magazine read worldwide. Thanks also to Caroline Laviolette with The Catamaran Company for introducing us to Eric. SuperYachttimes Our appreciation goes out to SuperYacchttimes.com for their support in promoting the Sea Mercy program to their members through their online newsletter. Based in The Netherlands, it is great to see Sea Mercy reaching into Europe and beyond. A big thank you to Randy's Custom Screen Printing and their great work in getting our volunteer t-shirts together. They do wonderful and professional work and have a heart for those in need. Give them a call if you need any special printing done.